Community groups and volunteers across North Yorkshire are taking the county's libraries into the future from 1 April. 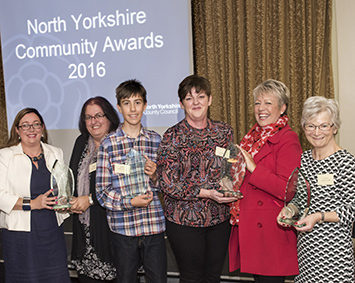 Our annual community awards have been launched to find the county's unsung volunteer heroes. Nominate yours. The County Council is setting out its ambitions for the economic growth of the county over the next 20 years. The County Council is to spend an extra £5.1m in the next 12 months on road schemes to support the economic growth of the county. Trading Standards officers warn that retailers must enforce the ban on anyone under 18 buying e-cigarettes after a recent prosecution. Plan ahead and have a great Tour... that's the message as the county gears up for the third Tour de Yorkshire cycle race. Are you registered to vote in election? Voters in North Yorkshire will go to the polls on 4 May to elect a new County Council to represent them for the next four years. Have fun and enjoy visiting open farms now that spring is here – but make sure to stay well by following some simple steps. York and North Yorkshire Waste Partnership with Hambleton District Council are holding a sale of compost bins starting from £8.